I like hash for both of the obvious reasons: Salt and fat. Any professional cook will tell you they're the secret ingredients that keep the customers salivating. 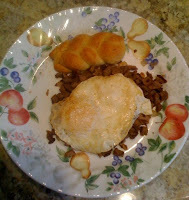 However, I'm still a big fan of hash for Sunday breakfast, and not just as a way to clean out the fridge. Truth in cooking disclosure: If you peeked at the picture, you've already figured out that this is not a cholesterol-free recipe. But because we're careful about choosing, trimming and cooking our meat, we know we're starting out with a healthy fat advantage compared to any canned hash or any processed meat -- and we can control the sodium content. Of course, our favorite leftover meat is lamb, but this works quite well with beef or chicken. When we make a roast, we always freeze the leftovers -- especially the bits that are too small or odd or charred to serve to guests. With a bit of creative trimming, those make the best hash parts. This is really simple, really basic and really satisfying. Only two main ingredients: Meat and onion. If you like potatoes and have one or two leftover, be our guest -- but there's no need. Even the egg on top is optional. In fact, it's probably better if you skip it. Note that I said "you." I like my hash slathered in yolk. Made it this a.m. DELICIOUS!